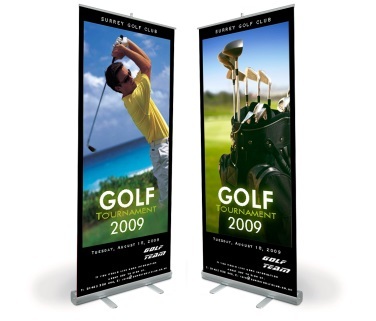 Retractable, or roll-up, banners are the most commonly purchased display type due to the compactness and ease of use. They provide a BIG message space for your graphic image and are easily transportable. A range of stand/hardware quality options, and sizes, are available to fit your space...and your budget. Economy banner stand shown. Sizes range from 24" to 59" wide and from 77" to 94" in height. Each comes with its own black carrying bag.